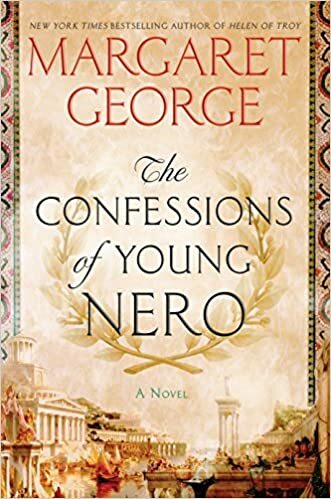 In the first of her two-part Nero series, Margaret George focuses in her encyclopedic way on the events of Nero’s youth and the first years of his reign as emperor. In her review of the book for The Washington Post, Diana Gabaldon (author of the Outlander series) states that George’s goal in writing this series was to change our perception of Nero, by placing his more infamous actions in the context of life in the upper reaches of Roman society at the time. Gabaldon states that the weakest point of the book is that it starts off when Nero is only three-years-old. No child has much of interest to share that young, so Gabaldon found the first 80 pages to be a bit of a slog. I didn’t. George had me hooked on the story almost immediately. In the opening pages of the book, we see an exceptionally young and utterly helpless Nero dangling over the side of a boat as he listens to his uncle Caligula idly debating whether or not to let him live. Nope, Caligula decides, and tosses the young Nero in. Nero is saved only because a Roman soldier dared to defy Caligula by plucking him out. As the book goes on, the child and then adolescent Nero witnesses a series of plots by his mother to poison various people. He connects the dots of the plots mostly after the victim has died, but he still clearly gets the point that his survival depends upon him trusting no one. Every one truly is willing to kill him, if he stands in the way of what they want. For the most part, the young Nero’s only vaguely normal moments come while he trains as a charioteer and wrestler on the sporting grounds, plays the cithara, and meets with his writing group. No wonder he does his very best to spend as much time as possible on those relatively straightforward pursuits after becoming Caesar. Margaret George is an excellent writer, and does succeed in presenting a more tolerant, but still plausible, interpretation of Nero’s more appalling deeds. George wove in enough details about Nero’s horrific relationship with his mother that by the time Nero kills Agrippina, it was hard to blame him. At various points, his mother drugs him, seduces him, and after a falling out, begins plotting to outright kill him so that she could put someone more manageable on the throne. I can see why Emperor Nero ultimately decided his very survival depended on killing Agrippina off before one of her many plots succeeded in killing him. My main quibble with George’s renovated Nero is her presentation of him as a skilled musician and poet who also happened to be Caesar. It’s clear that Nero was entranced by the arts. What’s not clear, and very likely impossible to ever really know for certain, is whether he was actually any good at them. Given the way society was structured around Nero, whether or not he was actually skilled at the arts seems like a completely unknowable thing. No one would have dared to tell Emperor Nero not to quit his day job, after all. And in fact, no one does. If they covertly laughed at his poems, we might never know. There is a hint of laughter in one of Locusta’s asides, but the bulk of the story is told from the point of view of Nero himself, and he reports the praise with only a few token doubts. He almost recognizes that no one around him would dare to express anything but overwhelming praise, but not quite.